For Shannon Brown, one of the best ways to peer into the future use of technology is to examine its past. Brown joined the Naval Postgraduate School Center for Homeland Defense and Security instructional staff this past fall and brings expertise into intersections of technology, society and homeland security. Just as the disciplines of medicine and science history have evolved to academic prominence, the history of technology is an equally important story. In an age in which homeland security practitioners and their adversaries embrace the latest drone, self-driving vehicle, or smart pill, there are innumerable implications for national safety. It also behooves students to consider how technology affects their duties. 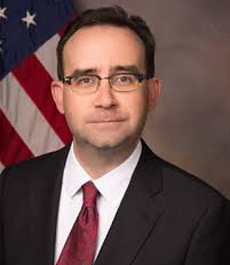 He joined the faculty of the Industrial College of the Armed Forces, now known as the Dwight D. Eisenhower School for National Security and Resource Strategy, in 2004 and would eventually serve as the Dean of Faculty and Academic Programs. That school has a special mission among joint professional military education programs to promote students’ understanding of strategic resource management. During his tenure there, he branched out into national security studies and public-private sector partnerships, especially within the context of arms and defense. Public-private partnerships have long been a topic in the emergency management profession. Brown sees emerging issues in that area to be addressed, such as accountability and what activities are inherently governmental or best left to private enterprise. For the past couple of months Brown has been observing CHDS courses and has jumped in as a thesis advisor, guiding a student who researching crypto-currencies and another who is looking in to how to maximize the social media narrative.